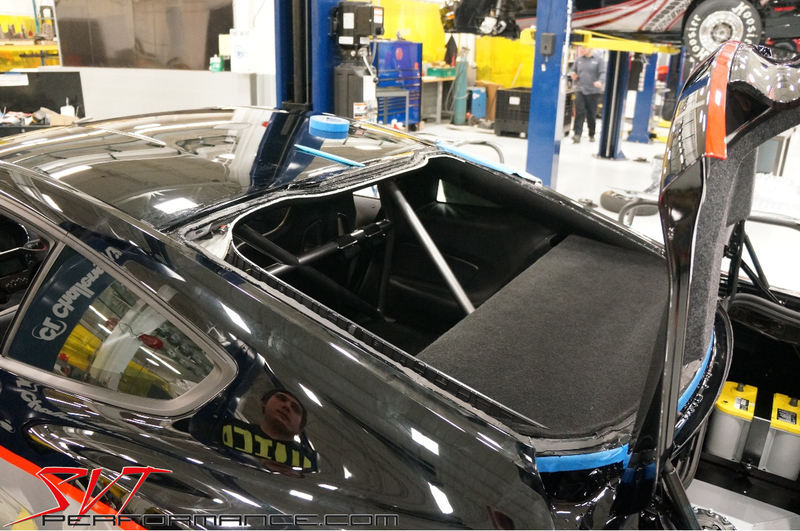 Lightweight 2015 Mustang Racing Windows – Clearly Lighter! Modern Mustangs are brimming with features and technology. This gear makes them great everyday cars that provide an amazing balance of comfort, convenience, and performance. However, when you want to slide down the cutting edge and turn one of these magnificent machines into a race car this equipment is just extra weight.When you are seeking to trim the fat out of a race car, you can approach all the obvious low-hanging fruit like interior pieces and unnecessary emissions hardware. However, when the obvious stuff is cast aside, it’s time to start approaching other areas. 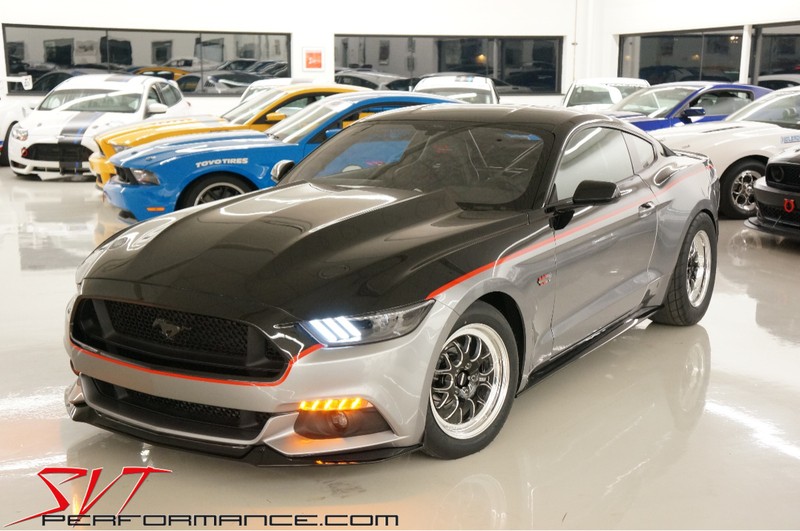 That’s just what Watson Racing sought to do with its stunning 2015 Mustang drag car. If you saw our pre-SEMA Show coverage of the Watson Racing S550, you know the car was quite striking. As one of the few straight-line machines in the Ford display, the car definitely garnered some attention in Sin City. “Reaction was overwhelming,” John Phillips said. “Demand for new S550 parts is high. We can’t get products to market fast enough!”Of course, like all SEMA projects, the Watson S550 was constructed on a tight timeline to make the big show. 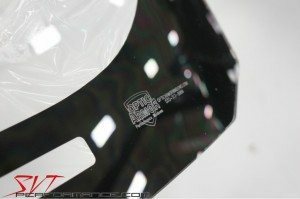 That meant the company wasn’t able to make all the modifications it wanted to before shipping it off to Las Vegas.“We are looking to shed as much weight from our 2015 and given the quality and fit, as well as the significant weight savings of the Optic Armor windows there is no sacrifice, no downside,” John Phillips, Watson Racing Products Manager, explained. The Optic Armor windows are delivered in a protective poly masking. Once you start installing them, you may want to leave it in place and just peel in back about 3 inches from the edge to keep the windows unmarred during the install process.The Optic Armor S550 DIBO windows are legit. 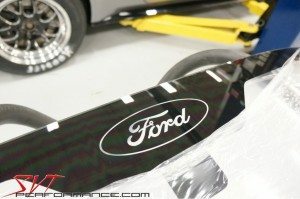 Not only are the formed to the factory shape, but they are even adorned with the Ford logo. 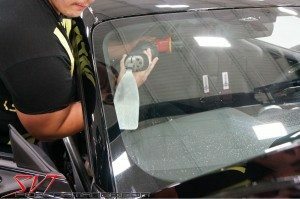 If you aren’t familiar with Optic Armor’s products, the company produces polycarbonate windows designed to replace the glass windows in your car. For racing purposes, these windows are not only lighter, but they are shatter-resistant, which adds an additional measure of safety. Beyond traditional polycarbonate windows, the Optic Armor windows are coated with the company’s proprietary Armor Coat, which helps them resist scratches, shed water, and retain clarity. Better yet, you can even clean them with traditional window cleaner, which would cloud other poly windows. Now, you might think it would be daunting to install racing windows in a new Mustang. Sounds like a really custom job, right? 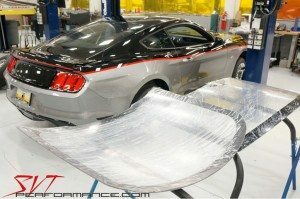 Not so, Optic Armor offers direct-replacement units for several vehicles, including the 2015 Mustang. These units are known as Optic Armor’s Drop-In Black Out windows. These units are cut to factory dimensions, designed to accept factory trim, and even feature a window for the vehicle identification number, just like the stock window. 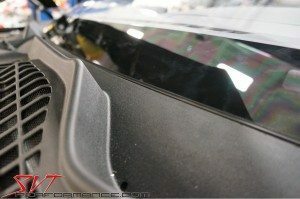 If you don’t own a brand-new race car, Optic Armor offers DIBO windows for Fox, SN-95, New Edge, and S197 Mustangs as well. 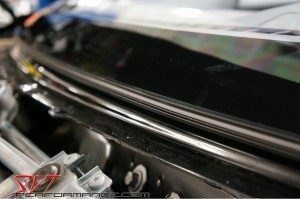 Obviously the thinner you go with the Optic Armor windows, the lighter they get, so follow along with our photos to see how you can drop weight and improve safety on your Mustang race car. 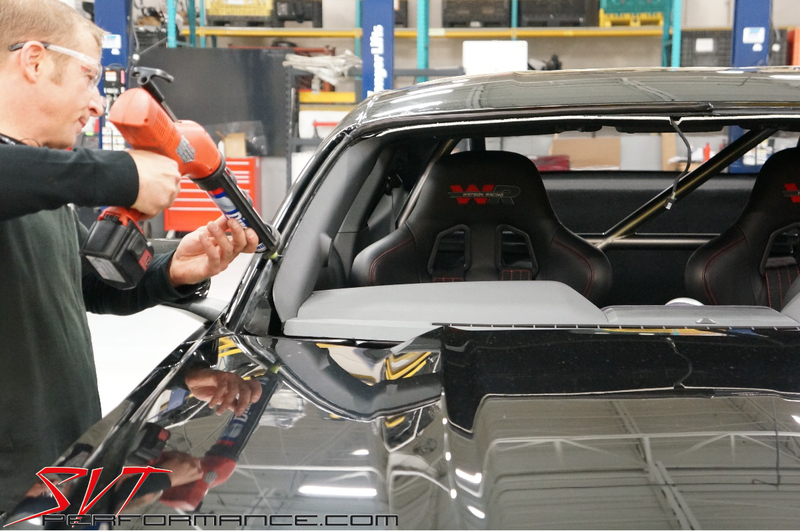 To ensure a smooth installation, Watson Racing turned to the experts at Nick’s Auto Glass, a company that has already performed several S550 installs. Nick Bommarrito started by removing the factory cowl panel. Nick Bommarrito continued by carefully separating the stock windows from their bonding sealant. Nick Somma and Nick Bommarrito carefully remove the windshield.The factory front glass weighs in at 27 pounds. Then the duo removes the factory rear glass, which tips the scales at 17 pounds. If you aren’t using a pro installer, be sure to check with Optic Armor to ensure you use the company’s preferred sealer to bond in your new windows. Here Nick Somma lays down a fat bead around the perimeter of the windshield opening. You can drop as many as 15 pounds with the Optic Armor DIBO windshield. For example, the 1/4-inch-thick version weighs 14 pounds and the 3/16-inch-thick version weighs 12 pounds. Once the new Optic Armor window is properly aligned to the opening, press it into place and let the sealer cure for the recommended time period before you take your car for a spin. There is a plastic strip at the base of the factory windshield that locks the cowl panel into place. 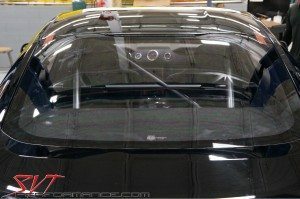 Before installing the new Optic Armor windshield, Nick and Nick removed the cowl retainer from the factory glass and bonded it to the new windshield. 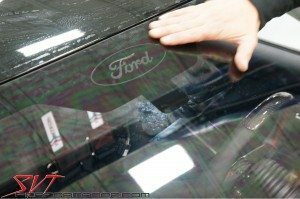 Before installing the new Optic Armor windshield, Nick and Nick removed the cowl retainer from the factory glass and bonded it to the new windshield. With that piece in place, the cowl was easily reinstalled. 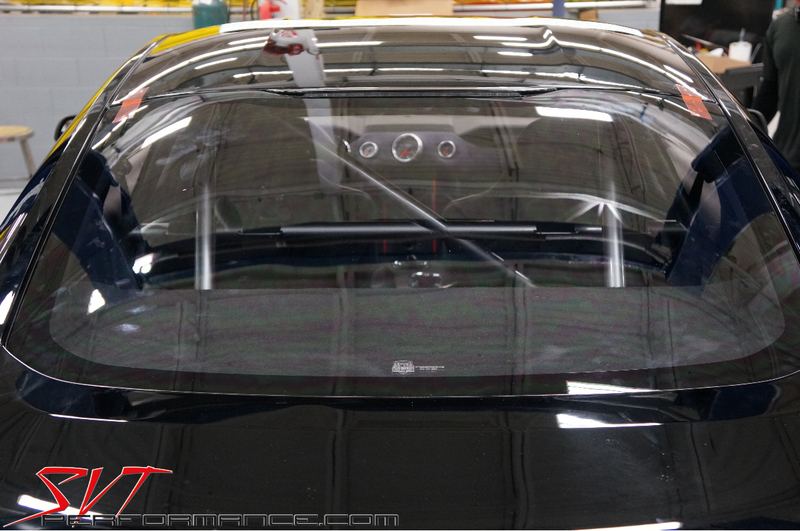 As with the windshield, the rear window requires a bead of sealer to fuse it with the body. Also, like windshield, the factory rear glass wears a glass-to-trunk lid seal. Nick and Nick swapped it to the Optic Armor window before installing it. In back you can drop as much as 10 pounds with the Optic Armor window. The 3/16-inch thick version weighs 9 pounds and the 1/8-inch-thick version only weighs 7 pounds.